not in fear for his life but because I knew that fishing technique. Last October 1, I wrote of two great blue herons who helped me cope with my disability as they dealt with theirs. I had not seen either heron for many months at that point and assumed they had gone Home. Then this morning I saw Ball Foot make his plunge – his way to fish because of a foot that was balled-up due to fishing line. I whooped in triumph with him as he pulled this fish from the Haw – oh, my. Posted in Haw River, Jordan Lake, photography, wild birds and tagged as Ball Foot, fish, fishing, great blue heron, great blue heron fishing, Haw River, Jordan Lake. What a fantastic story and experience. Being able to name the herons is amazing. I cannot wait to show my little boy this post, he’ll want to know where’re it is, when he can go, will the herons still be there and will he be able to throw stones into the river! I am going to follow you, inspiring, thank you for sharing. 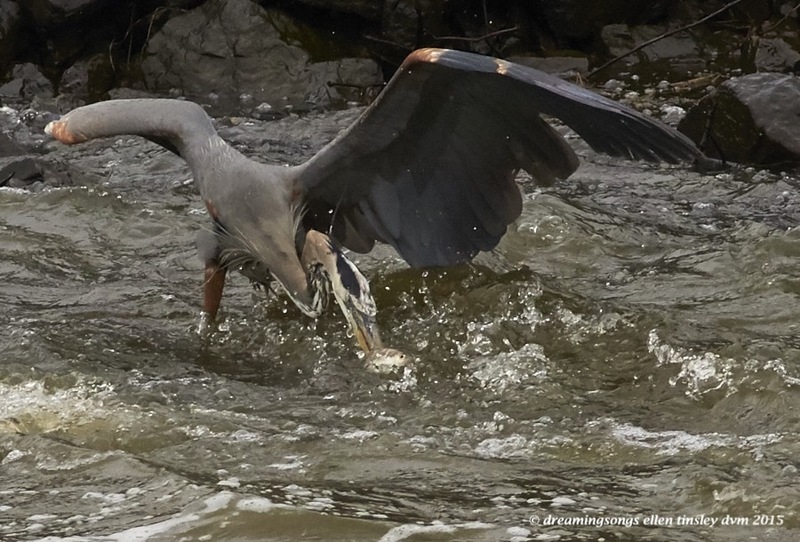 The herons live all up and down the Haw River and I see them in various places – they don’t stay put for long periods. The Jordan Lake also has lots of herons. As to Ball Foot I see him most often below the Jordan Lake dam but I can’t guarantee you when he might be there. Birds are independent spirits. About throwing stones in the river: birds don’t like stones being cast about so I discourage that activity. It is better to pick up a stone, study its shape and color and placement on the bank and then return it to its home.